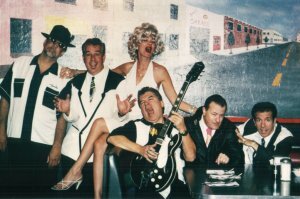 Since the group's inception in 1970, DADDY-O, has been a non-stop entertaining fun-machine. They combine comedy, dancing, and acting, with their masterful musical abilities, to make for a truely memorable performance! DADDY-O has an extensive repertoire sounding convincingly like the originals of all your favorite tunes from the '50's and '60's. They enjoy playing a different set every time they get on stage, so you can count on a "fresh" and energetic show time after time. That's why people return again and again to see DADDY-O.